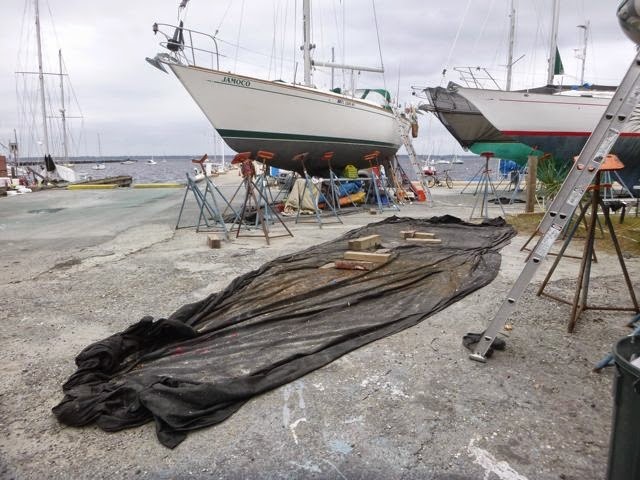 to make way for the next sailboat in the work yard. 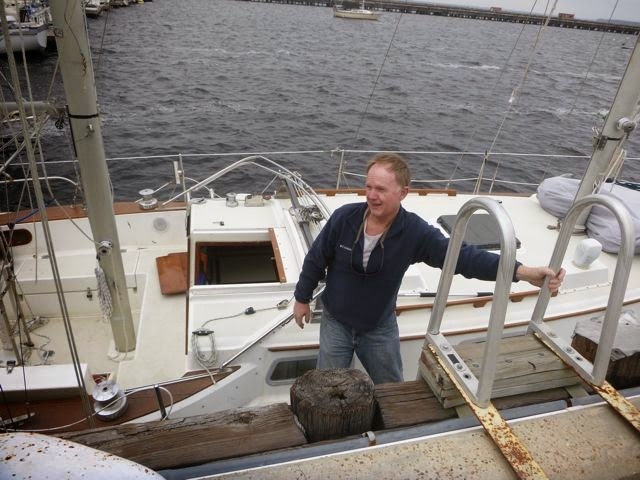 Part of cruising preparation often includes periodically hoisting the boat out of the water for maintenance, then, eventually returning it to its watery womb. 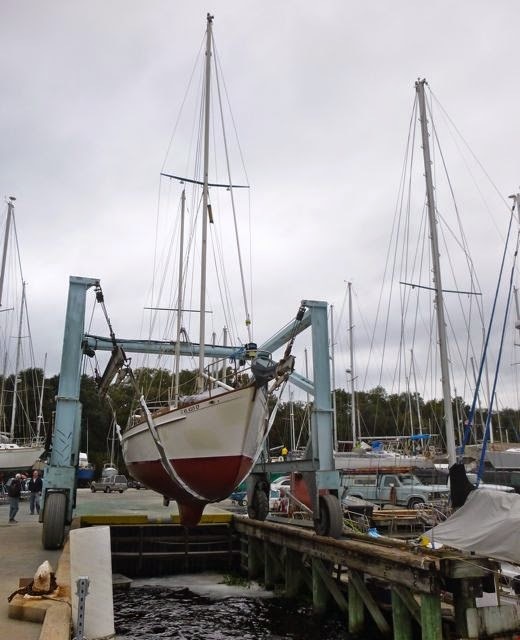 As a boat owner, it's an unnerving experience, watching relative strangers lift, suspend and move your 9 ton baby across crushingly hard surfaces. 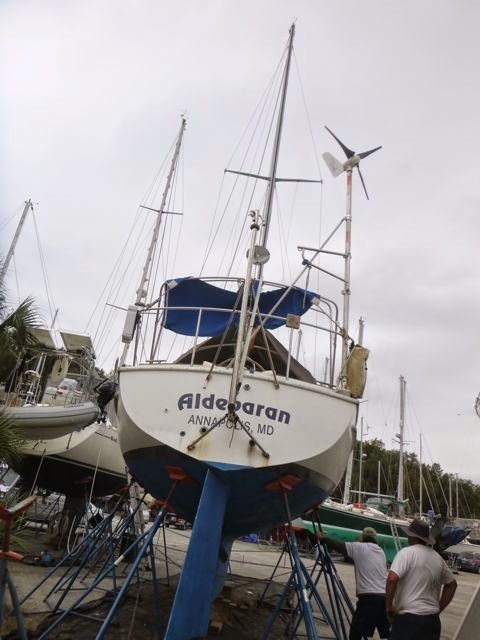 Then it gets propped atop widely spaced seemingly spindly stands, excruciatingly close to other boats atop equally spindly stands, masts high like a herd of tightly confined antisocial giraffes, tall and close, but not touching. Journey's out of the work yard. The reverse process is both more exciting -- getting ready to resume our adventures! -- and more stressful. Yesterday marked Journey's day to return to water, exiting Green Cove Springs, her temporary dry dock of the last 5 months. about to be suspended by just a few belts. It was a chilly day with a cold breeze blowing. The skies were leaden, the day dark. Our boat was scheduled to begin its move at 2:30 pm. We'd planned to prep the boat for sailing, and arrived later than we'd wanted to, at 1:15 pm. There wasn't a lot to do; an hour and 15 minutes was plenty of time for some cleaning, set up and straightening and a quick check to see what we'd need was in working order. Besides, when our friend Ann of Krazy Lady left, she was scheduled to leave at 9 am, and left closer to 1:30 pm. 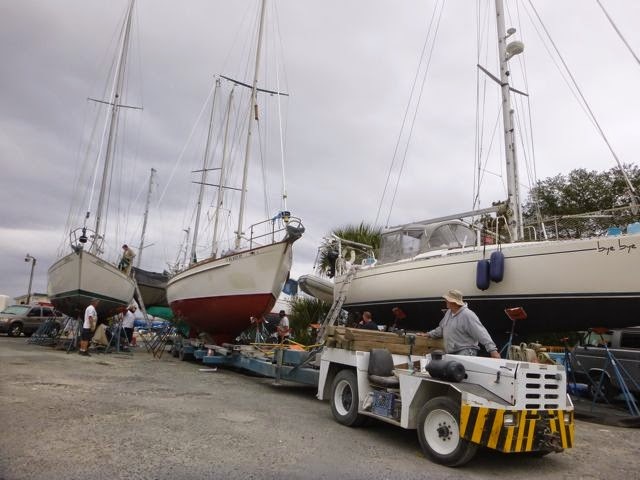 We pulled up to see the tractor and crew taking down the stands and moving our boat into the tractor. No prep time for us! Wayne climbed aboard. My job was to send him off with lunch and warm clothes, drive to JAX Naval Air Station (NAS) Mulberry Cove Marina, get us checked in and be there to assist with docking upon Journey's arrival. Within less than 1/2 hour, another boat was sitting where Journey was and Journey was suspended over the water. "Will the boat still float?" 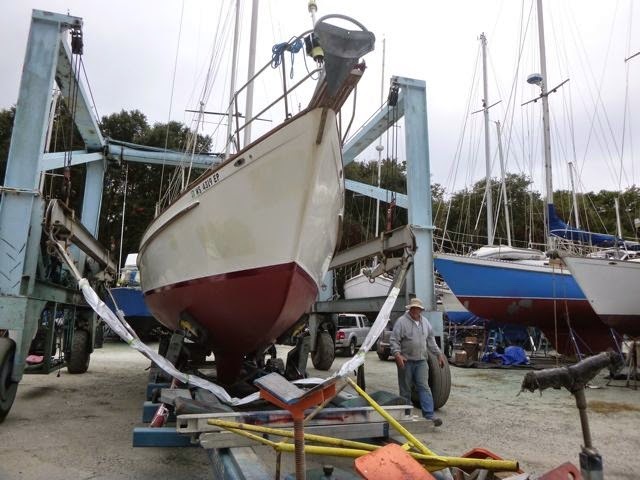 "How quickly do I need to move my boat before the next one needs me to be gone?" "Will I make to my destination safely and before dark, successfully dodging the plethora of crab pots in the fading light?" to drop into the water. In just minutes, another boat was scheduled to be on the dock where Journey just dropped. The experience conjured up the distant memory of my brother taking me for a late night joy ride in his souped up Datsun 610. As he sashayed the car through the curvy hills of Santa Clara County's unpopulated Almaden Hills, he glanced at me and commented, ""You're awfully relaxed for someone who knows I did all the brake work on this car myself!" "I wish you hadn't said that," I retorted, getting a better appreciation of the adage, "Ignorance is bliss." "She floats!" Wayne exclaims with great relief. Next up, will the engine start? 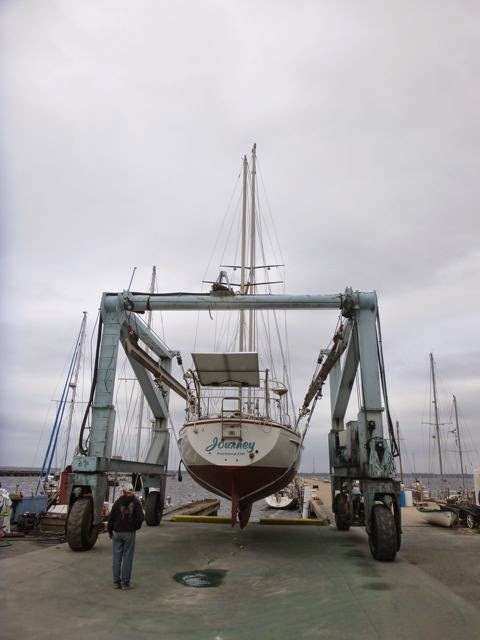 Journey was fully in the water and sailing -- well -- motoring, as our our disassembled rigging was still on the to-do list by 1:15 pm, 15 minutes before she was scheduled to begin to move. She arrived, safe and sound at JAX Mulberry Cove Marina at twilight, safe and sound. We love adventure, but when it comes to the mechanics, we like it best when "Easy does it," is the order of the day. Journey is at Jacksonville Florida's Mulberry Cove Marina (N30.12.980 W81.40.234) until early December, waiting for us to set sail for the South Pacific. 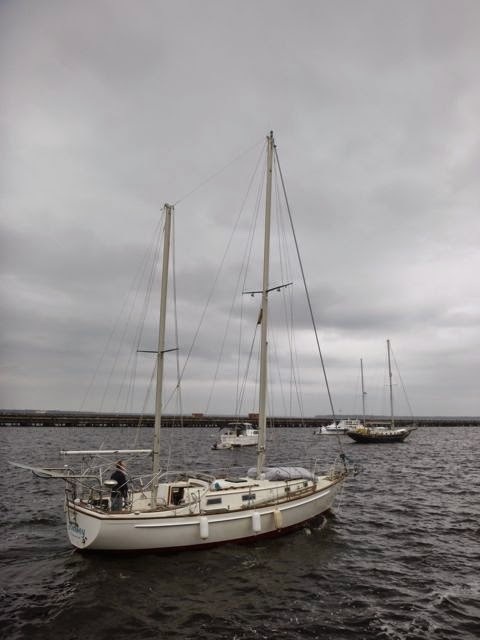 We'll be moving back aboard, finishing up her rigging, cleaning and provisioning, trying to finally decide what our long distance communication system will be (ham radio and modem? sat phone? a host of smaller simpler hardware and software pieces?) as well as a host of other cruising preparation before we take off.